It is almost time for Thanksgiving!!! Doesn't it seem that Thanksgiving is now pre-Christmas? I staunchly leave my Thanksgiving stuff out until the Friday after - not trying to rush Christmas in!! 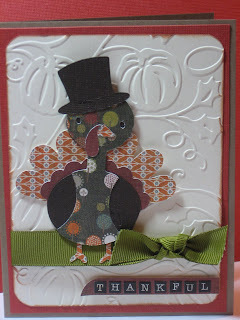 To get in the spirit, I made this Thanksgiving card using the Create a Critter Cricut cartridge. The paper is Pyrus from Basic Grey. I hope this gets you ready for Thanksgiving! !